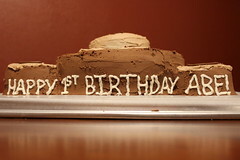 Long time, no write....Abe is 1! Abe had his 1–year check-ups last week, and all looks good! He’s still just a small kid (19 lbs, 3 oz), but he’s staying on his curve (about the 5th percentile), so that’s good. He had a chest x-ray, and the surgeon was pleased with how everything looked. By now, Abe’s own tissue has grown over the patch and dissolved it, so his diaphragm is all his now. It’s a little lower on the left side than the right, but that’s normal for having it repaired. We don’t have to see the surgeon again for another year! If the hernia doesn’t recur by next year (which is always a risk, but not likely), it sounds like it probably never will. However, Abe will always have the risk of volvulus, twisting of the intestines. Since his intestines aren’t attached to his abdominal wall like most people, there’s always the chance that they could twist on themselves and cut off the blood supply. If untreated, this would cause his intestines to die and ultimately lead to Abe’s death. So if Abe ever has green vomit (or gold, or yellowish, or some other color that isn’t normal), we call Dr. Bufo (the surgeon) and take him right to the ER for a stat upper GI. Joel and I each have a prescription for it that we carry with us, because it only takes about 6–8 hours for the intestine to die. We’re grateful that there’s a sign to watch for that indicates this is happening so we can do something about it. The chance of this happening is pretty small, but it will always be something he has to watch out for, even when he’s a white-haired, 80-year-old man. 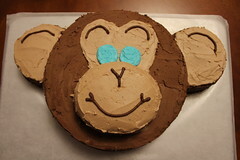 We celebrated Abe’s birthday with family. 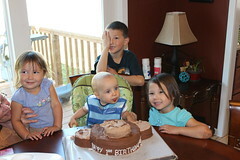 He was pretty apprehensive about digging into his cake, but he still managed to make a mess. He’s walking all over the place, and he does some baby signs. He doesn’t have any consistent words yet, but we can tell that he tries to imitate us. Abe loves our cat Ibu, and Ibu tolerates him very well. She often comes into his room in the morning and snuggles up next to him. I have a few favorite times of the day with Abe: Before his morning nap, we sit on the floor, snuggle with a blanket, and read books. I also love watching Abe’s expression when Joel comes home for lunch and at the end of the day. He just lights up and waddles over to him to give him a kiss. Abe eats just about anything. Some of his favorite foods are avacado, venison sausage, spaghetti, and fruit. He still sleeps 12+ hours at night and for now is still taking two naps, but I know that will end soon. Abe loves baths and is becoming quite accomplished in getting his bath-giver soaked by the end of the event. 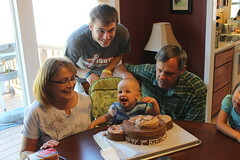 Thursday will be the 1–year anniversary of Abe’s surgery. It’s incredible to think of how far he’s come. 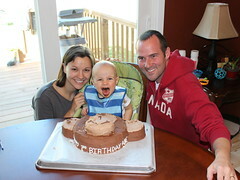 When he was born, we weren’t even sure if we’d get to bring a baby home, but by God’s grace, we did! We continue to pray that Abe’s life will bring God glory, and that we as his parents would raise him up to be a man of God. We are so humbled and unbelievably grateful when we think of how the LORD has used each of you in our life and in Abe’s life, and for the countless prayers that bombarded Heaven on Abe’s behalf. How wonderful to be part of the family of God! We love you! 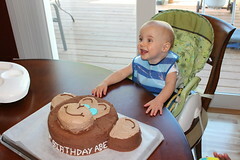 It seems like forever ago that I last wrote an update about Abe, but it’s only been 2 months. Abe continues to do well. He had appointments on Monday and we got good reports! He had a chest x-ray and follow-up visit with the surgeon, Dr. Bufo. He was pleased with how Abe is doing and doesn’t need to see him again for 6 months! We also learned that since Abe’s colon makes a couple hairpin turns instead of 90 degree turns, he’ll have a tougher time getting things to move through. As a result, we started prunes on Wednesday. ;) Dr. Bufo recommend that we see a pediatric spine specialist to check out the “butterfly vertebrae” that are visible in Abe’s x-ray. These are vertebrae that didn’t completely close, so instead of a complete ring, there’s a little gap in them. Dr. Bufo is not too concerned, but wanted Abe to see the orthopedist to be sure. What’s one more specialist, right? Our appointment is April 19th. Abe also had his 6 month check-up with his pediatrician. He’s still at the 10th percentile for size, weighing in at 14 lbs, 11 oz. His shots were a little tougher this time around, but he calmed down after a few minutes. 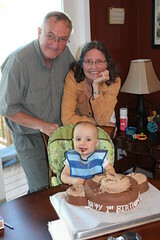 We dedicated Abe to the LORD at church on March 18. 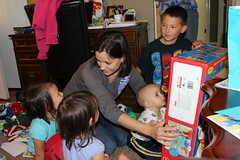 (He was 1 of 5 babies dedicated, with 3 more in the near future.) It was certainly a special time – something we weren’t sure we’d get to experience 6 months ago. God is good! Abe has eaten – and liked – every solid food we’ve given him so far, including broccoli, yellow zucchini squash, and avacado. 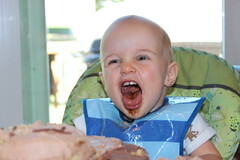 He made some funny faces with the prunes and bananas, but still eats them. He’s so close to rolling over from his back to his tummy....his arm just gets in the way. He still hates tummy time, though, so I have a feeling crawling is a ways off yet. He can sit for a few seconds if we balance him just right, and he’s making new sounds and noises. He loves Daddy’s loud kisses and when Mom tickles him under his chin. Abe is also enamored with Ibu, our cat. He watches her whenever she’s in the room, and starts kicking his legs whenever she comes close. Ibu’s even let him pet her a few times without revealing her claws, so that’s good. Abe is a huge fan of his Johnny Jump Up. And so am I because I can get supper made while he’s in it! Abe has become a great sleeper.....he sleeps straight through the night from 6:30pm to 7am, and he has a couple 1–2 hour naps during the day. Joel and I are very grateful for the “Healthy Sleep Habits” book we received as a gift – thanks, Traci! We’re headed to North Dakota to spend Easter with my family, so Abe will get to meet whichever members of the Heringer clan will be at Uncle Wayne & Aunt Jude’s. Easter is my favorite holiday. What could be better than celebrating our Risen Savior who conquered death and gives us eternal life? We continue to pray that Abe will someday accept Jesus as his Savior and that he will know, love, and serve Christ Jesus as Lord. Our updates will probably be fewer and further between, but Joel will continue adding pictures and videos to the website periodically, so feel free to check it out once in a while. We are so thankful for all who have journeyed with us, and we praise the LORD for all that He has done!